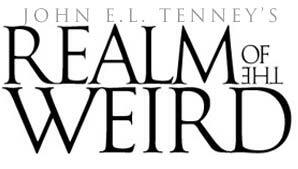 John E.L. Tenney’s Realm of the Weird was a bi-weekly podcast modeled after the old time horror radio shows of the 1940′s -1960′s. Listeners are presented with startling, chilling and always weird tales, based in fact, from the actual case files of paranormal researchers. Episodes are between 15 and 30 minutes in length and aired whenever they are posted. New episodes are released when new strange things happen. Since this podcast is based on real incidents and not fiction it is updated sporadically. John E.L. Tenney is one of the most well-recognized investigators of paranormal/occult phenomena in America. Mr. Tenney has been actively involved in the field of occult, paranormal, and conspiratorial research for almost three decades. His columns, spanning the fields of UFOlogy, hauntings and conspiracy theories, have been printed in magazines and newspapers world-wide, and he has lectured to numerous public and private schools, universities, organizations and clubs, it is estimated that over the past 28 years more than 75,000 people have attended one of Mr. Tenney’s signature “Weird Lectures”. John is the author of more than a dozen books and due to his extended time involved in paranormal research he has acted as a consultant for numerous companies including, but not limited to, Discovery, History Channel, A&E, Fox, SyFy, The New York Times, NBC and ABC. He hosts the paranormal podcast Realm of the Weird which Real Detroit Weekly named best Podcast in Michigan for four years in row.